Enter to win one of 2 Print copies of The Wolf Who Loved Me! They have a strong sense of smell. Their noses are quite adept at sensing when you’re nearby. They can smell your perfume, even the lightest of rosewater scents added to a bath or a dab behind the ears. So, never assume that you can enter and leave a room without a Lycan being aware of it. You can’t even eavesdrop at a door without them knowing you’re nearby. I once went without any scents at all, and Weston still knew I had been in his study. You can’t blame a lady for being curious about a strange missive, can you? Well, he did. If not for his nose, I could have gotten away with being curious. Anyway, choose an alluring scent for your Lycan. His nose will appreciate the extra time and attention. They have a high tolerance for spirits. They can drink twice the whisky of an average man and still show very little effect from it. So, never think you can get what you want because your Lycan is foxed. It’s usually quite the opposite. He’ll let you think he’s foxed until he cajoles you right out of your gown. Yet all the while, he was completely aware of what he was doing. They enjoy the great outdoors. And I mean REALLY enjoy it. I have always favored a walk in the park with my parasol, but Lycans actually like to get dirty. They walk on their bare feet in the mud and Weston even drags me into it. You get used to it after a while. Just be careful of the mud; you never know if mud is truly mud, or at least I didn’t. It could be worse than mud. To clarify – never assume mud is mud. Ever. But learn to enjoy frolicking under the light of the full moon, because your Lycan will drag you out with him whenever the urge calls. Get on his alpha’s good side. Or better yet, his alpha’s mate’s good side. When you marry a Lycan, you’re connected to his entire pack and it will always be in your best interest to make sure those in this highest position are fond of you. I can’t speak how to woo an alpha (grumbly creatures that they are) but I’m sure Lady Eynsford would have some tips in that regard if you’re interested. Don’t be afraid to let your most daring side come out. Lycans are daring creatures and you never know when you’ll be called upon to jump from chamber windows, dash across courtyards without slippers, or race through forests with a wolf nipping at your heels. There you have it! My tips on how to woo a gentleman werewolf of your very own. If you’ve snagged one yourself or think you have what it takes to do so, please feel free to share your own tips. THE WOLF WHO LOVED ME BY LYDIA DARE – IN STORES APRIL 2012 Regency England Has Gone to the Wolves! Lydia Dare is the writing team of Tammy Falkner and Ava Stone, who have written two paranormal historical romance series. 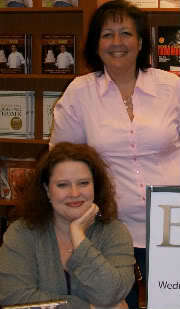 Both Tammy and Ava are active members of the Heart of Carolina Romance Writers and live near Raleigh, North Carolina. Together they are working on the next book in their new paranormal historical series as Lydia Dare, Wolfishly Yours, set to release in November 2012. For more information, please visit http://www.lydiadare.com.